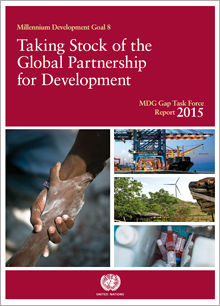 In its latest report, the MDG Gap Task Force found much progress towards achieving the goals set under MDG 8. There was a notable increase in official development assistance, a breakthrough in trade negotiations in Bali, an extension of duty-free and quota-free access to developed country markets for least developed countries, and greater availability and falling costs of telecommunications in developing countries. However, the report also highlights the many challenges that remain. While official development assistance hit a record high, aid flows to some regions declined and total flows still fell short of commitments made by UN Member States; agricultural subsidies in Organisation for Economic Co-operation and Development (OECD) countries remain entrenched, small States continue to face longstanding debt sustainability challenges; and essential medicines continue to be unaffordable and insufficiently available in many countries. With the MDGs concluding in 2015, this report underscores the need for a renewed political commitment to development cooperation and to a coherent set of substantive policies for global development.